The Committee of Ministers' Deputies of the Council of Europe held its 1213th meeting on the 26th of November 2014. Within the frames of the item "the Council of Europe and the Conflict in Georgia" of the agenda, Georgia's Permanent Representative with the Council of Europe made a statement regarding the signature of the so called treaty between Moscow and the Sokhumi occupation regime. 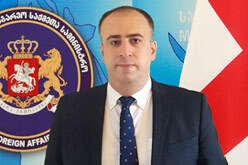 The Georgian representative emphasized that such action of the Russian Federation runs counter to the principles of international law and represents a further step taken towards the annexation of Georgia's occupied region of Abkhazia. Georgia's Permanent Representative called upon the Council of Europe member states to properly assess this fact and take respective steps in order to avoid Russia's destructive actions in the future. The EU Representative distributed the EU statement among participants of the meeting to which the Former Yugoslav Republic of Macedonia, Montenegro, Iceland, Albania, Bosnia and Herzegovina, Liechtenstein, Norway, San Marino, Ukraine, Turkey and Moldova acceded. Delegations of the Council of Europe member countries addressed the meeting reaffirming full support for the position of the Georgian delegation. The Russian representative was the only rapporteur to register a position different from that of the majority of the Council of Europe member countries.